Remove the fuel pump relay (1). 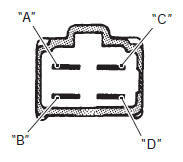 First, check for insulation with the tester between terminals “a” and “b”. Next, check for continuity between “a” and “b” with 12 v voltage applied, positive (+) to terminal “c” and negative (–) to terminal “d”. If continuity does not exist, replace the relay with a new one. Refer to “fuel line inspection” in section 0b (page 0b- 10). Refer to “fuel level gauge inspection” in section 9c .